Had to run to Blockbuster to pick up a new movie to watch with my guy tonight. I've never seen Equilibrium but pretty much any film that takes place in post-apocalyptic times is fashion eye candy! Plus Christian Bale AND Taye Diggs? Say no more. I was also running low on tomato sauce which is a serious code red because there is ALWAYS at least one day out of the week that I crave spaghetti and have to have it. With these ill-timed errands, I took this chance to create a more casual remix of my outfit from Friday night. 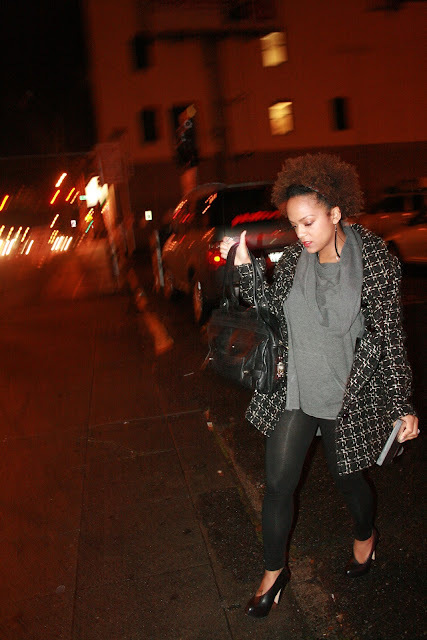 This time I paired my poncho and wool swing coat with a simple pair of leggings and thick sturdy leather heels. This Asos poncho has an enormous funnel neck about 3 feet long. When worn, it falls beautifully and looks more like a loose scarf. It makes an otherwise casual drab jersey poncho look actually a little dressy. If you like what you see, don't forget to comment! Thanks, Clara! I visited your blog and love your collages! Great eye you have.